Officials from the arts venue decided to end an impasse with demonstrators who on Tuesday evening greeted the opening of Brett Bailey's Exhibit B at the Vaults in south London by blockading both the entrance and the road leading to the building. Two hundred protesters with drums and placards demonstrated outside, prompting the attendance of officers from both the Metropolitan police and British transport police. The officers were summoned to address reports of a disturbance, but made no arrests. The event was quickly cancelled. The installation, which garnered acclaim and brickbats on display in Edinburgh, was due to remain open in London until Saturday. Its abandonment was hailed as a victory by campaigners who claimed 20,000 signatures on a protest petition against what they called "complicit racism". But the move is bound to prompt fresh discussion about the extent to which artists can legitimately use shock and graphic images to make points and address controversial issues. 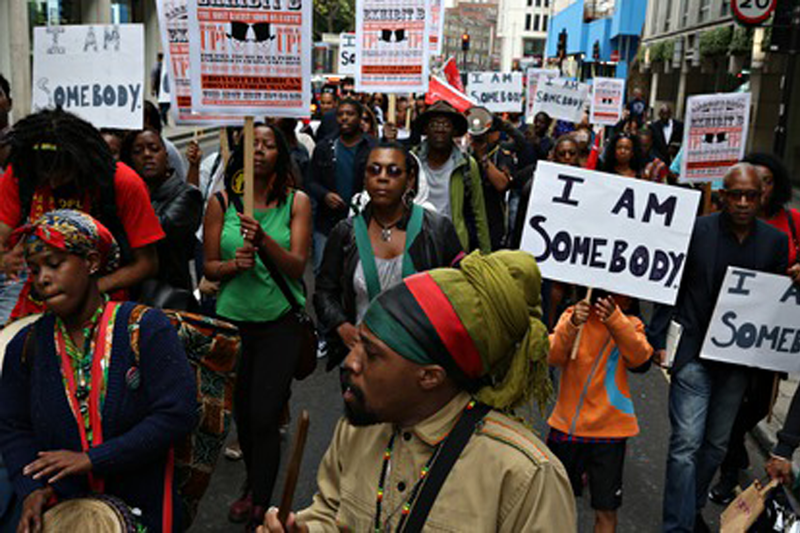 Simon Woolley, coordinator of Operation Black Vote and a former equalities and human rights commissioner, said efforts had been made to communicate to the Barbican the strength of feeling. "They underestimated it. They failed to see people's anger at being exploited in this way. This was a vanity project. Having people objectified in this humiliating way was always going to cause a fierce reaction. It is a shame that it reached this stage but the feeling was that no one was listening." In a statement, the Barbican said: "Due to the extreme nature of the protest outside the Vaults, regrettably we have cancelled this evening's performance of Exhibit B as we could not guarantee the safety of performers, audiences and staff. We respect people's right to protest but are disappointed that this was not done in a peaceful way as had been previously promised by campaigners." A statement handed to protesters by the Vaults, an independent venue which had been hired by the Barbican, went further. “This evening’s performance has been cancelled. Further subsequent performances up to and including Saturday 27 have also been cancelled,” it said. The Barbican is expected to confirm the cancellation of the London project early. The installation arrived in the capital with an enviable reputation. Peter Brook described it as "an extraordinary achievement". A review in the Guardian said the South African artist's work was both "unbearable and essential". According to the Barbican itself, "Exhibit B critiques the 'human zoos' and ethnographic displays that showed Africans as objects of scientific curiosity through the 19th and early 20th centuries." The 12 tableaux featured "motionless performers placed in settings drawn from real life." Together, it said, the images "confront colonial atrocities committed in Africa, European notions of racial supremacy and the plight of immigrants today." But protesters said any good intentions were outweighed by the scenes of degradation. Among the strongest supporters of the project were the actors involved. Prior to Tuesday's protest, they met with demonstrators, but neither side was able to convince the other. In a statement seeking to head off the controversy, they said: "We find this piece to be a powerful tool in the fight against racism. Individually, we chose to do this piece because art impacts people on a deeper emotional level that can spark change. "The exhibit does not allow for any member of the audience, white, black or otherwise, to disassociate themselves from a system that contains racism within it. We are proud to be black performers in this piece; to represent our history, our present and ourselves by playing the various characters taken from the record books." Protesters also met with the Barbican's board, but talks ended without agreement, setting both sides on a collision course.